Proboscidea is an order of mammals which include the elephants and the extinct mammoth. Modern day Proboscideans have a long muscular trunk, long tusks and think stumpy legs. Early Proboscideans do not have a long trunk. The proboscideans are also called proboscids. The African Bush Elephant is the largest proboscid, and it’s also the land animal in the world today. 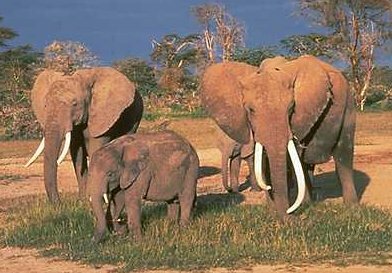 Modern day Proboscidea is represented by the Elephantidae family. There are three different species of elephants. They are the two species of African Elephant, and the Asian Elephant which is an endangered species. The Asian elephant is the biggest living land animal in Asia. Scientists have found out that there are two different species of African Elephant. They are the African Bush Elephant and The African Forest Elephant. 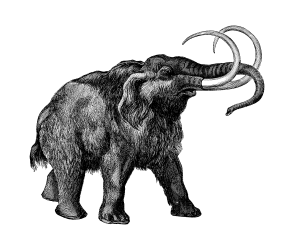 Some extinct Proboscideans include the woolly mammoth and the mastodon. Mastodons were shaggy, large tusked herbivores which lived during the last Ice Age. Its tusks could be grow over 5 metres (16.4 feet) in length. The tusks curved upwards but are straighter than the woolly mammoth. Their back did not slope like the woolly mammoth. They had longer and flatter heads than the woolly mammoth. They are about the size of an Asian Elephant which about 3.2 meters(10 feet) high at the shoulder. Their ears are smaller than modern elephants . Based on the type of teeth they had, they were browsers and not grazers like modern elephants and woolly mammoth. The woolly mammoth also lived during the Ice Age period about 150,000 years ago. The fully grown male woolly mammoth was about 2.8 metres (9.2 feet) to 4.0 metres (13.1 feet) tall. They could weigh up to 8 tonnes(8.8 tons). They had a thick layer of shaggy hair, up to 1 meter in length (3 feet) with a fine underwool which would have kept them really warm in the extreme cold. They also had very small ears compared with a modern elephants’ ears. The largest mammoth’s ears was only 30 centimetres (12 inches) long compared to the 180 cm (6 foot) ears of an African elephant. Their skin was no thicker than the modern day elephants. However, there are lots of oil glands in the skin which secreted greasy fat into their shaggy hair to insulate their bodies. Apart from that they had a layer of fat under their skin which is 8 centimetres (3.1 inches) thick to keep them warm too. They have a high pecked head. They had very long curvy tusks which were about 5 metres (16 feet) long.